Communities – Page 1677 – Welcome to Wyandotte Daily! The Kansas City, Kan., Board of Education honored two Employees of the Month at the April 8 board meeting. 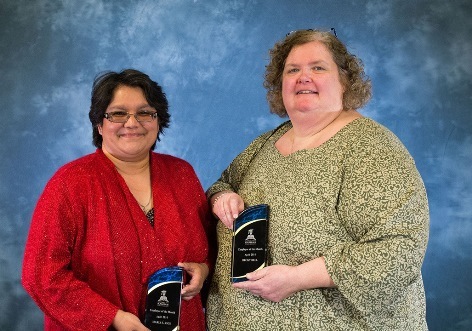 Maria Rios, secretary at Wyandotte High School; and Becky Bell, 5th grade teacher leader at White Church Elementary School, were honored. April showers signal spring in the air. But are your children in a fog during the stormy testing season? Healthy breakfast is a necessity. Breakfast eaters perform better academically and behaviorally. Here’s how to boost the brain with better breakfast. Embrace eggs. They contain choline, which is vital for memory and concentration. Try French toast for picky eaters. Make with 100 percent whole wheat bread and top with fresh fruit. Get nutty. Peanuts contain folate, which improves memory and mental processing speed. Enjoy natural peanut butter on an apple or a few nuts on the side. Skip the sugar. High-sugar foods and white breads result in energy crashes, likely in the middle of a demanding test or class. Go bananas. Bananas sharpen focus, mood and memory. Add to whole grain cereal with skim milk. It’s simple to start your student’s day off with a strong breakfast for success, and don’t forget to eat some yourself! Chrishonda Brown, who holds a master’s degree in kinesiology, is a guest columnist for Kansas State Research and Extension, Wyandotte County. For more recipes visit www.kidsacookin.ksu.edu/. Like our Facebook page at www.facebook.com/KSREWyco and follow us on Twitter @WyCoSnapEd. Wash hands and cooking surfaces. Mix all ingredients in a blender until smooth. Pour into glass and serve immediately. Nutritional information for each serving: 359 calories, 12g total fat, 2g saturated fat, 0g trans fat, 5mg cholesterol, 44g carbohydrates, 5g fiber, 28g sugars, 136mg sodium, 17g protein, 11% Vitamin A, 22% Vitamin C, 32% calcium, 18% iron. The free KCK Kiwanis West Bike Rodeo returns Saturday, May 17, to the Schlitterbahn Waterpark, 9400 State Ave., Kansas City, Kan.
Elementary-aged kids will have the opportunity to learn tips on cycling safety, participate in interactive activities that promote health and safety and to sneak a peek at attractions at Schlitterbahn Kansas City Waterpark at the eighth annual bike event. Hours are from 9 a.m. to noon May 17. The event sponsors plan to distribute up to 300 free bike safety helmets and T-shirts to participants. Activities will take place in the parking lot and entrance area of Schlitterbahn, and a large turnout is anticipated. Children should be accompanied by an adult. The KCK Kiwanis West club, in partnership with Atmos Energy, Schlitterbahn Kansas City Waterpark, Judi’s Bakery, Big D Cycling and several community businesses and organizations, are helping area youth ride their bicycles safely. Kids are encouraged to bring their bicycles. Helmets will be fitted, bikes will be inspected for safety, and kids may visit bike riding stations to earn a safety certificate. Just as helmets reduce the risk of injury in bicycle accidents, car seats are vital for kids’ safety in automobiles. That’s why the event will also feature a free, drive-through car seat safety check. Experts will inspect car seats and ensure they are installed securely in families’ vehicles, making sure restraints are age appropriate and facing the right direction. “Motor vehicle crashes are the number one killer of children from ages 1 to 14,” said Kimberley Holm, a member of the Kiwanis West club and a certified National Child Passenger Safety Technician with the Wyandotte County Sheriff’s Department. “Even though most parents understand the importance of putting their children in car and booster seats, seven out of 10 kids in child safety restraints are not buckled in properly. We want to reduce that number,” she said. Holm will be joined by Donald Paul Jones, the Safe Community coordinator with the Unified Government Health Department. Together with their volunteers, they will be available to check that child safety seats are properly installed. New to Schlittlerbahn this year is the Verruckt waterslide, the world’s tallest waterslide. Schlitterbahn season passes will be on sale for $5 off the full gate price on that day. Season pass holders will be able to process their Schlitterbahn identification cards in person during this event. Bike rodeo participants will be treated to free doughnuts, courtesy of Judi’s Bakery; get to enjoy performances by kids affiliated with Kansas Academy of Theatrical Arts; tour attractions at Schlitterbahn; get a close-up look at emergency vehicles; get into the groove with fun Zumbatronics workouts; and engage in other activities, games and crafts provided by local businesses. Cabela’s will be on hand, providing a free fishing derby experience for the kids. Additional sponsors for this event include: Legends Honda, Legends Toyota, Country Club Bank, Board of Public Utilities, Sunflower Dental, August Resources, PACES, Country Place Senior Living, Chick-Fil-A, Dr. Jane Philbrook, Wyandotte County Sheriff’s Department, Kansas City, Kan., Public Library Foundation, Adventurezip KC, Eric McTye – Edward Jones, Providence Medical Center, Liveable Neighborhoods and First Legend Bank and Trust. Those with questions on the day of the event may call 816-751-4227.